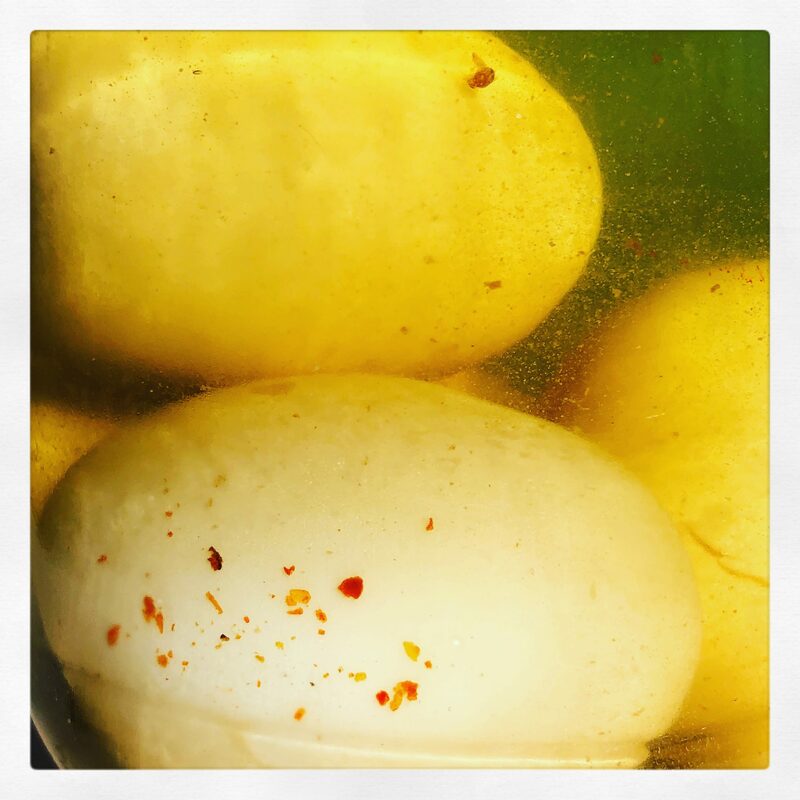 Pickled eggs are amazing. When you’re hungry and looking for a post workout snack at night these eggs WILL stop you reaching for the the naughty treats. Trust me. They’re easy and they taste great. Serve these with a few lumps of cheese and a few bags of snacks when you and your mates stumble home after a night out and you’ll be a hero. If you make these every few weeks you’ll always have them to hand. Make them when you’re bored at home on a Saturday morning. You need a large clean jar. I use an old jar which came with gherkin pickles in it from Lidl (it was a 670g net weight). I ran the jar though my dishwasher and rinsed the lid out in hot soapy water. Boil your eggs. You want them good and hard-boiled so start them off in cold water and bring to the boil for 15 minutes. Take your clean jar and throw in the the dry ingredients. When the eggs are done bring the saucepan over to the sink and start to slowly add cold water from the tap. Let it overflow for a few minutes. Leave the eggs to sit in the cold water like that for a little while. Take out each egg and gently tap-tap-tap the eggs onto the chopping board to crack them. Once cracked gently give them a little roll on the chopping board to crack those shells. Now peel each egg. If it gets messy just swill the egg under the cold tap and the shells will rinse away. Place each egg one by one into your waiting jar. With all of your eggs in the jar take the vinegar and fill the jar to halfway. Top up the jar with cold water from the tap and screw the lid on. Give it a very gently shake). (Optional) Before you screw on that lid, fold a sheet of the greaseproof paper into a square and place this onto the top of your jar and screw the lid down over it.